The animated outfit have announced the event in today's Metro. Gorillaz appear to have announced their live return and a new festival this morning. 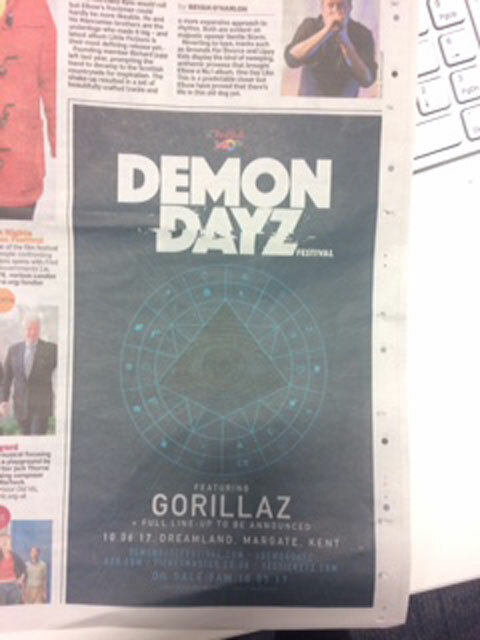 The Damon Albarn and Jamie Hewlett-created band shared an advertisement in today's Metro for the Demon Dayz festival in June. The Dreamland event - which is set to take place in Margate, Kent on 10 June 2017 - adds that it will feature the animated band with a "full-line-up to be announced". Tickets are said to go on sale this Friday 10 March 2017 from demondayzfestival.com. The news seems to corroborate the words of a fan who bumped into Damon Albarn last week. According to Jack Winstanley, Albarn told him the fifth release for the animated band is complete and the band are rehearsing for a new Gorillaz tour, which the Britpop icon had already got a new hat for.